Indonesia | A balanced diet . . .
During the 19 years I worked at the International Rice Research Institute (IRRI) in the Philippines, I traveled to most of the countries in Asia, some repeatedly (Laos, for example) and others (such as Sri Lanka) just the once. I must have visited Indonesia half a dozen times, mostly to Jakarta (on the island of Java) and to Bogor, about 64 km south of the capital, where one of IRRI’s sister centers, the forestry institute CIFOR, has its headquarters. My first visit to Asia, in 1982, was to Indonesia. I stayed in Bogor for a couple of nights at the famous botanical garden there before returning to Jakarta to attend a genetic resources conference. However, it wasn’t until 2005 that I experienced the beauty of Bali for the first and only time. Bali’s landscapes are dominated by three volcanoes in the north and northeast, the highest of which is Mt Agung, active since 2017. These landscapes have been molded by generations of rice farmers who built and still maintain terraces to grow their precious crops. The soils, volcanic in origin, are fertile, and appear very productive. IRRI’s Board of Trustees (BoT) meets twice a year. One meeting, in April, is always held at the institute’s headquarters in Los Baños, some 70 km south of Manila. The other meeting is often co-hosted by one of the institute’s national program partners with which IRRI collaborates to develop better rice technologies. Such joint meetings are often the opportunity for Board members (who come from a wide range of backgrounds, not necessarily agricultural) to better understand national rice production issues, and to see first hand how technologies are being tested, and disseminated to and adopted by farmers to increase agricultural productivity. Rice varieties on display (above) and technologies (below) at a field day for IRRI’s Board of Trustees. 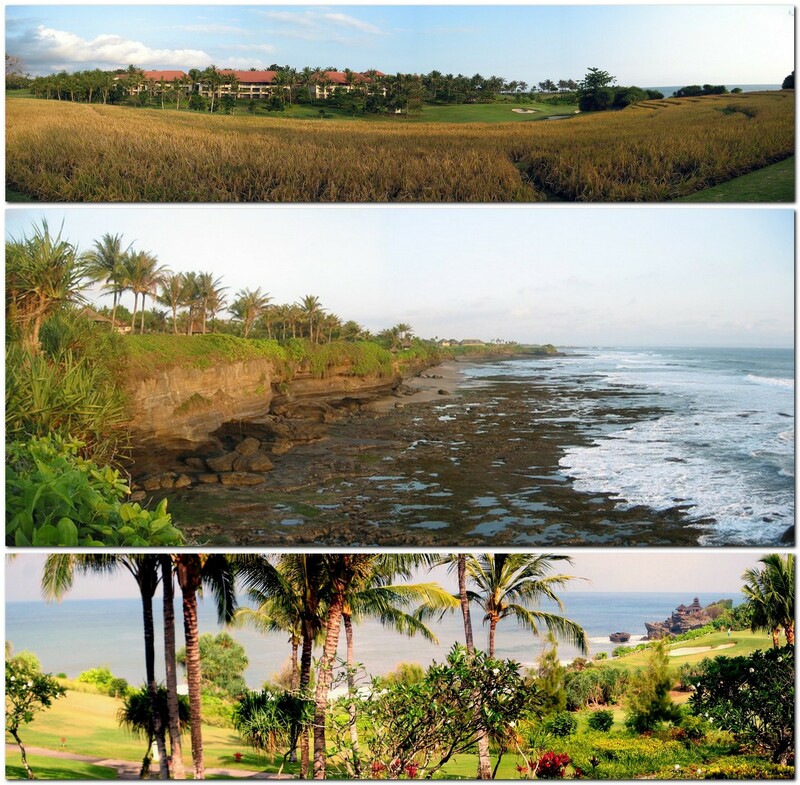 In 2005, the September BoT meeting was held at the Pan Pacific Nirwana Bali Resort 27 km west of Bali’s capital Denpasar. Steph joined me on this trip for only the second time (she did join me on a trip to Laos in 1997, then to Japan in 2009). We flew from Manila via Singapore on Singapore Airlines. The BoT meeting lasted three days, and while we were locked away in presentations and discussions, the group of IRRI wives who had come along for the trip took various excursions around the island. 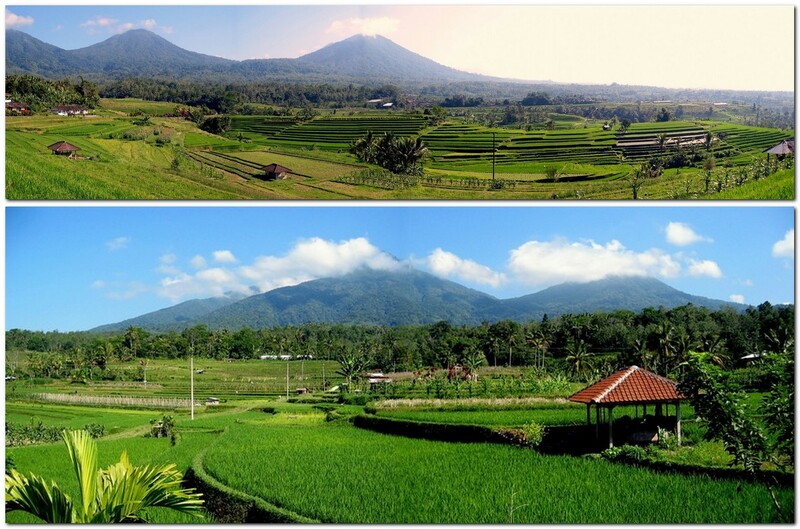 Fortunately, we scientists and management also got to see something of Bali, the fertile volcanic landscapes, and rice agriculture on the picturesque and iconic rice terraces typical of the island. Bali has a thriving tourist industry, but at the Nirwana resort we saw very little of the multitudes that flock to Bali each year. In any case most tourists stick close to Denpasar and its nightlife, in resorts located to the east and south of the capital. The coast west of Denpasar still remains unspoiled and uncrowded, however, according to an article that appeared in The Guardian today. The hotel was very comfortable, and we enjoyed a large room with a balcony overlooking the restless Indian Ocean (next stop south: Antarctica!). The resort lies in the middle of an 18 hole golf course, interspersed with rice fields and lotus ponds, so there were ample opportunities for long walks at sunset. Several bars and restaurants are dotted around the complex, most with views over the golf course or the ocean. There were several pools to relax in. Once the IRRI Board meeting was done and dusted, Steph and I decided to extend our stay over a long weekend. Just a short distance along the coast from the resort stands the famous and revered 16th century Hindu temple at Tanah Lot with access along the beach. Unlike much of Indonesia (which is the world’s largest Muslim nation), Bali is primarily Hindu, and that is reflected in its culture, dances, and customs, some of which we experienced at a reception one evening. In just over a week, we just sampled the flavor of Bali, but it would take an extended stay to become immersed in its vibrant culture. While I would like to return, one day, there are so many other places that I just have to explore first, given the opportunity.